EAST LANSING, Mich. (AP) Nick Ward scored 21 points to help No. 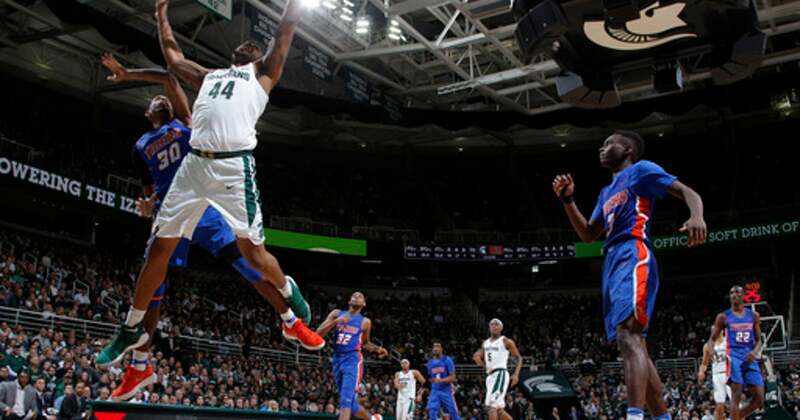 2 Michigan State rout Savannah State 108-52 on Sunday. Miles Bridges added 19 points and 21 rebounds for the Spartans (14-1). They won their 13th in a row and have scored 100 points in four consecutive games for the first time in school history. The Spartans shot 63 percent from the floor and held the Tigers scoreless over the last 8:50 of the second half during a 32-0 run. Savannah State (3-12) lost for the eighth time in nine games, the last six in a row. Dexter McClanahan led the Tigers with 14 points. No. 21 CINCINNATI 82, MEMPHIS 48. HIGHLAND HEIGHTS, Ky. (AP) – Gary Clark had 13 points and 10 rebounds for his fourth double-double of the season, and Jarron Cumberland scored 15 points, leading Cincinnati past Memphis and extending the nation’s longest active home-court winning streak to 34. Playing their first game in 10 days, the Bearcats (12-2, 1-0 American Athletic) came out rusty but turned up the defense and were in control by halftime. Kareem Brewton Jr. led Memphis (9-5, 0-1) with 17 points. The Bearcats are playing this season at BB&T Arena at Northern Kentucky University while their on-campus arena is renovated. They went 18-0 at Fifth Third Arena last season. OMAHA, Neb. (AP) – Marcus Foster scored 18 points and Creighton beat cold-shooting Providence. Toby Hegner matched his season high with 15 points to help the Bluejays (11-3, 1-1 Big East) bounce back from a road loss to Seton Hall in their conference opener. Creighton never trailed and went on a 13-4 run spanning the halves to take control. Nate Watson led (10-5, 1-1) with a season-high 20 points.